With the closure of Newfoundland’s railway in the 1980's, the Avondale Railway Station was shut down. The building itself, over 100 years old, has since been declared a Heritage Structure by the Heritage Foundation of Newfoundland and Labrador. The Avondale Railway Station houses two museums: a railway museum and a community museum. The five-car static train display contains a dining and cook car. The Community Museum exhibits artifacts of life in the fishing and agricultural community. The Railway Museum exhibits artifacts of life and work during the time that the railway was in operation in Newfoundland. The second floor contains a period bedroom and Newfoundland furniture. 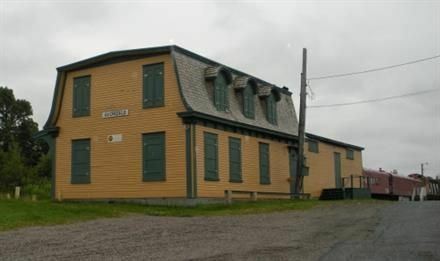 The Avondale Railway Station is a two storey Second Empire style building with attached warehouse, located in Avondale, NL. The designation is confined to the footprint of the building. The Avondale Railway Station was designated a Registered Heritage Structure by the Heritage Foundation of Newfoundland and Labrador in 1988 because of its historic and aesthetic value. Avondale Railway Station has historic value because of its association with communications and transportation in Newfoundland. The building was constructed either in 1870 or 1880 to serve as a repeater station for the first telegraph land line serving St. John’s. In 1898 the Reid Newfoundland Company entered into an agreement with the Newfoundland government to operate existing railway lines across the island. Avondale served as a freight and passenger station, being an important terminus for branches serving Conception Bay and Placentia Bay. The Reid Newfoundland Company played an important role in the development of transportation in Newfoundland. In addition to operating a mainline between the east and west coasts, the Reid Company also ran several smaller branch lines. The Reid’s were promoters of the pulp and paper and mining industries, as well as operators of a coastal boat service and telegraph line. Twenty-five years after assuming control of the railway, the Reid Newfoundland Company began to concentrate on other development schemes and wished to rid itself of the unprofitable railway. In 1923, following much political manoeuvring, the government of the Dominion of Newfoundland once again assumed responsibility for the railway, as well as the coastal boat service and St. John’s drydock. With Confederation in 1949, the Canadian National Railway took over the operation of railway lines in the province. Until its closure in 1984, the CNR used the Avondale station as a terminus for their passenger and freight service in Conception Bay. Temporarily closed due to maintenance.